Walking with Jesus: Day 47: Acts 14:24-28 & Proverbs 17:20-28 - What is the Value of Having Missionaries Come Back Home and Make Reports? Day 47: Acts 14:24-28 & Proverbs 17:20-28 - What is the Value of Having Missionaries Come Back Home and Make Reports? What is the Value of Having Missionaries Come Back Home and Make Reports? For as long as the church has been sending out missionaries, we have received those missionaries back to hear reports from them. Today's reading is Luke's account of the very first missionary report. Paul and Barnabas have spent two-and-a-half years, from the late spring of 44 to the fall of 46, taking the Gospel to Cyprus and to Asia Minor, planting and strengthening churches. Now they have finished this mission trip and have returned to their sending church in Antioch. 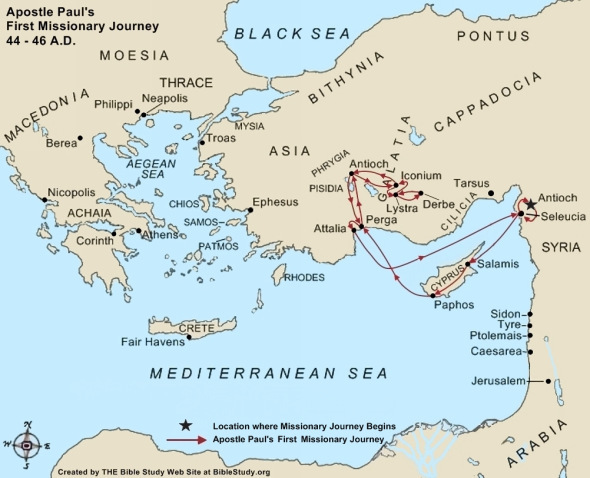 Paul and Barnabas would end up staying in Antioch for almost three years, what Luke refers to as "no little time." So, why do we have missionaries do this? Why do missionaries return for home visits or home assignments? Let's look first at the right reasons for such visits, then consider the practical realities of how these visits tend to work today, and then how we can perhaps restore them to their rightful purpose. 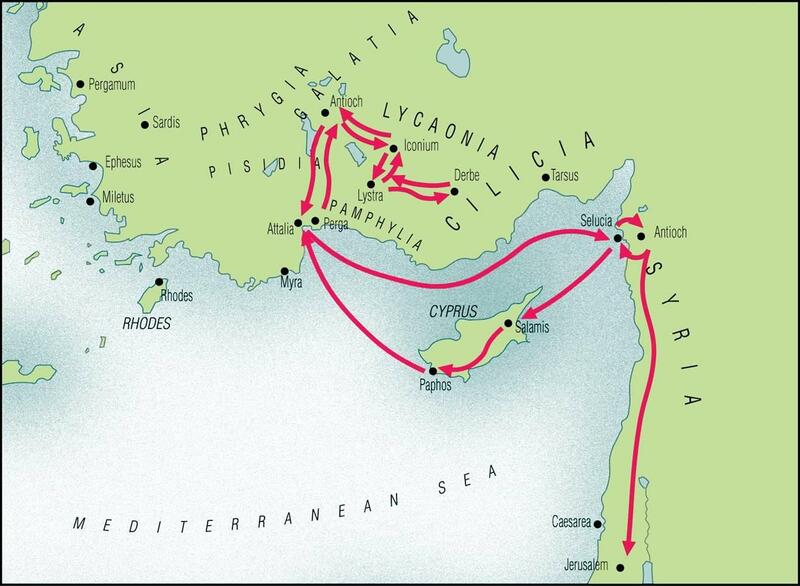 Paul and Barnabas returned to Antioch because they had finished the work they set out to do. They had a specific goal in mind for their missionary journey; they completed that journey and then they returned home. 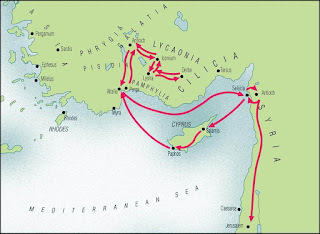 They took the Gospel to the whole island of Cyprus and then to a central and vital region of Asia Minor (present-day Turkey). Thus, it seems that home visits are ideal at times when specific goals have been reached or specific tasks have been completed. Paul and Barnabas returned to report on the good news of what God had done through them. In a world before digital media and the Internet, or even photography, personal visits were the best way to get a full report of what God had been doing. Personal reports are still vitally important. Seeing missionaries face-to-face and hearing them tell us directly what God has been doing through their ministry has unique value for encouragement and strengthened mutuality. Paul and Barnabas had done an incredible amount of work in 2 1/2 years and had faced severe opposition and incredible stress. They needed rest and refreshment. The travel, the preaching, the work, the intense discussions and debates. the fierce opposition and the unruly mobs all made this mission trip unique in its stress. Missionaries are people, too, and they need periods of rest and recovery. 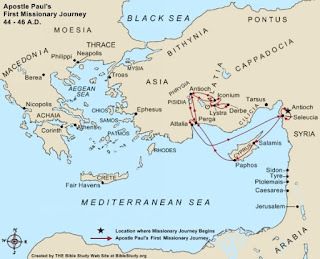 Finally, Antioch was the home church for Paul and Barnabas, and they had vital ministry work there, too. These missionaries were not disconnected from the church. They were grounded and committed to their home church, and they desired to minister and strengthen their church. All of these are wonderful reasons for missionaries to come home and report of God's work through their labors. Unfortunately, the reality for too many present-day missionaries is that the #1 reason they have to make home visits is to raise and strengthen their financial support. This is compounded by the reality that their support is not coming from one church or a small handful of churches but from a large number of churches and individuals, often scattered over a wide area. These realities require missionaries to travel and speak a lot whenever they are home, visiting current supporters and trying to raise new support. This makes their home visit much less restful and not really an authentic time for sharing burdens and strengthening each other. They're almost forced to be salespeople for their ministry, rather than truly functioning as ambassadors for Christ coming home for rest and mutual encouragement. One way we can move toward correcting what has become a broken situation for missionaries is for churches to support fewer missionaries with a deeper commitment toward each of them. For example, instead of taking $100,000 and spreading it out over 15-20 missionaries, what if churches limited their commitment to five missionaries and invested deeply in each of these? Not only would they be able to give each missionary $20,000/year, but they would also be able to pray meaningfully and regularly for these missionaries. Another way we can improve things is by going back to having missionary support come through the church instead of individuals. Many Christians don't give their missions support through churches but directly to individual missionaries. This means more work for the missionary to keep in contact with supporters. Finally, we should also let the missionaries determine when would be best for them to come homes, instead of imposing artificial timetables on them. If mission work is to be the core commitment of the church, then we need to make sure we are supporting missionaries in a deep way that eases their burden and allows them the freedom to minister. They need the church for accountability, oversight, wisdom, support, encouragement, prayer and fellowship. Heavenly Father, send out the light of Your Gospel through Your church to the nations. We confess that Your church is self-centered and our commitment to missions is too shallow and a matter of personal convenience. Cleanse us of our worldliness and lack of faithfulness in our missions work. Give us wisdom, love for missions and missionaries, and a true, deep commitment to Your kingdom's advance in the world. In Jesus' name, Amen. and realize the high cost of folly and the importance of the call of wisdom. and keep us far from the path of folly in our lives. Father, Your goodness gives us so many reasons to rejoice, to laugh and to give thanks. Lord, thank You for laughter and for wonder. that they would walk in integrity and wisdom. Guide our leaders in justice and righteousness. and give them fruitful lives in Your Spirit and not futility. Lord, set a guard over our lips and restrain us from folly. Give us cool spirits that we may develop true understanding. that we may not respond in haste in the moment but wisely discern Your will. used by You to advance Your people and strengthen Your church.